SARD Fuel Injectors - Dezod Motorsports Inc - Home of the automotive performance enthusiast since 2002. SARD’s high quality fuel injectors ensure the proper and reliable delivery of fuel to the engine. Fuel injector upgrades are recommended on all modified vehicles where injector duty cycle of factory injectors begins to reach 85%. SARD fuel injectors are of the highest quality and provide reliable fuel delivery under various loads. 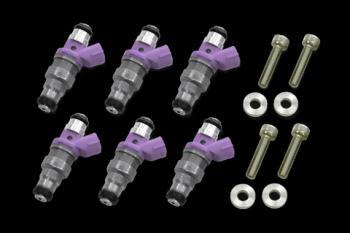 SARD Fuel Injectors are available as individual Injectors or Complete Injector Kits. An upgrade kit that consists of injectors, grommets, and other parts for proper installation. Upgraded fuel rail may be required for this injector sizing.